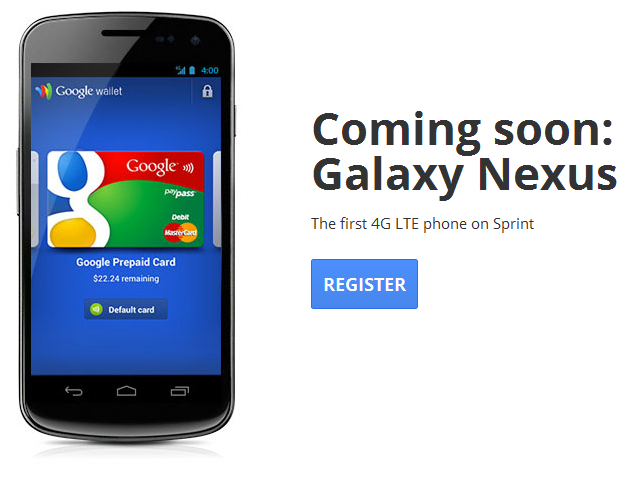 The official sign-up page for the Sprint Galaxy Nexus has gone public on the Google Nexus site (see second bullet), as tipped by an Android Central forum reader DaEXfactoR. Outside of this random Google+ mention from Jan 17th, this seems to be the only reference to the sign-up page on the web, so chances are you haven't seen it yet. Either way, if you're looking for information on how to rock the first and best ICS phone on an unlimited data plan without grandfathering (or so we hope), you'll want to go sign up posthaste. Or, you know, just follow Android Police. Or both. We don't need to tell you that this phone is a powerhouse (or do we? ), but it is worth mentioning that the Sprint version, unlike the Verizon Galaxy Nexus, will be sporting Google Wallet out of the gate. It's unnerving to see how many new Android devices, even those equipped with NFC chips, lack this functionality, but it's really not a huge surprise, considering everyone but Sprint seems to be working on a Wallet competitor, ISIS (though we've yet to see ISIS in action). We hope that Sprint won't take too long getting this device to market. The Galaxy Nexus has been on the European market for about two months, and one month on US soil. Even by Android device standards the Galaxy Nexus isn't stale just yet, but that won't last long, plus we'll be happy to start using it before any LTE markets begin to roll out. Seriously, Sprint, we've used plenty of 4G phones without 4G anywhere around, so we're used to it by now.